A party is a gathering of people who have been invited by a host for the purposes of socializing, conversation or as part of a festival or any special occasion. A party typically features food and beverages, and often entertainment. This time the theme of Healthy Wellthy Group is "Party Theme". So I have prepared a beverage for the contribution. Instead of depending on fizzy drinks available in the market, it is better to have something homemade for parties. And, yes the homemade virgin grilled pineapple mojito proves that. 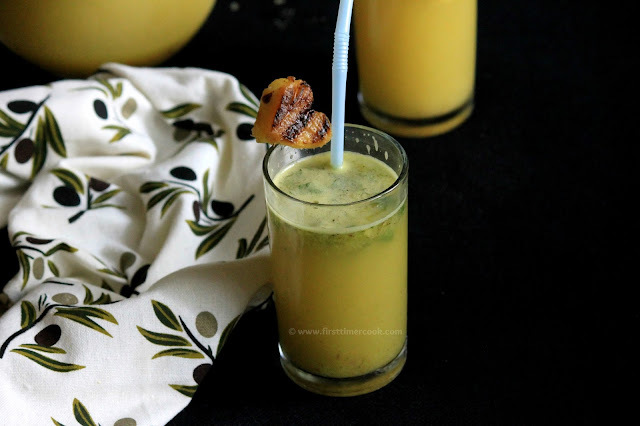 Virgin grilled pineapple mojito - A fun and easy twist to the traditional refreshing virgin mojito which gives a whole new level of fruity and smoky flavors. Traditionally, a mojito is a cocktail that consists of white rum, sugar, lime juice, soda water and mint leaves. But here, this mojito is purely non-alcoholic. 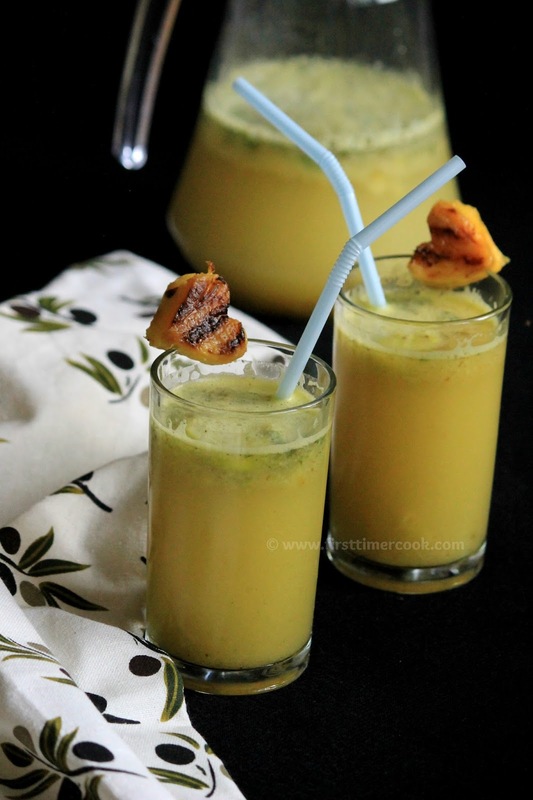 Freshly picked mint leaves are muddled with some grilled pineapple chunks. Grilling the pineapple before preparing the drinks really brings out its sweetness and flavor up to fullest. Do not char the pineapples, but just achieve the golden brown delicious coloring on pineapple slices. This is a so easy to make mock-tail as just grill the pineapple slices, muddle everything and relish. 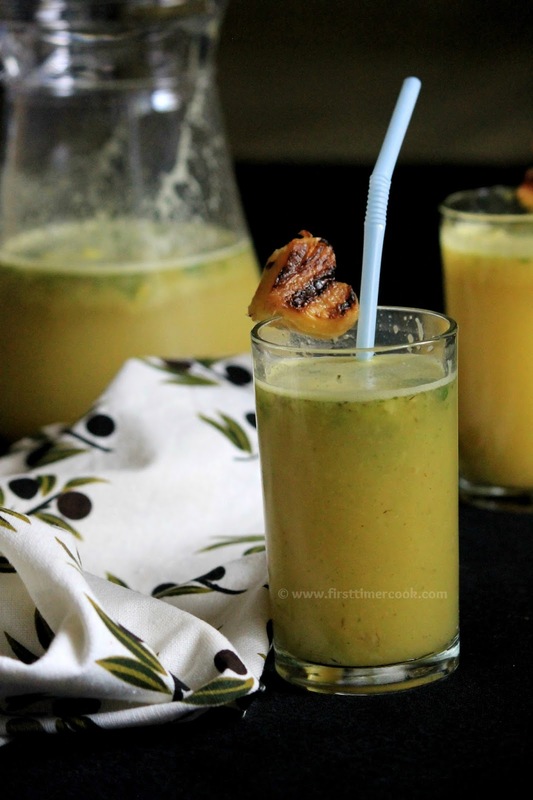 If you’re looking for a fancy mock-tail for your next upcoming party, then I can assure that the virgin grilled pineapple mojito is the ideal match. Made with a simple combination of ingredients, it tastes absolutely divine. So lets go in details as mentioned below. In a blender put all the grilled pineapple slices except keeping 1 slice for further use. Blend well to make a puree. Chop that grilled pineapple slice which is kept aside. Take a jar and add 5-6 fresh mint leaves, chopped grilled pineapple slice, sugar syrup and lemon juice. 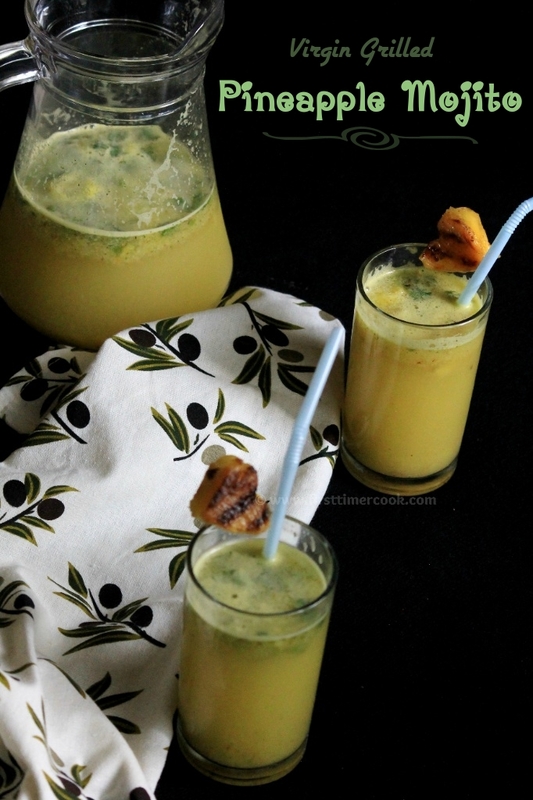 Muddle everything well to release the aroma of mint as well as grilled pineapple using a muddler or just use a spoon to gently crush / bruise the mint leaves, chopped grilled pineapple. Pour the grilled pineapple puree in it & mix well. Take a serving glass, fill the mixture till 1/4 of the glass. Add some more chopped mint leaves, slowly pour chilled sparkling water into the glass till it almost reaches the brim and stir to mix. Serve immediately chilled with ice cubes ! Sugar syrup can be store bought or homemade. Quantity of sugar syrup may vary depending upon the sweet desire. Only chilled water can be used instead of chilled soda water. Here are few more recipes you can try as bread pizza , chatpata masala papad , Delhi style aloo chat , cinnamon sugar twists , chicken 65 , chocolate cake. I will add some rum in mine. Loved your version. Great for summer. Never tried a mojito with pineapple, looks fantastic!..Will surely make a wonderful party drink.. Loved the refreshing combination!! Can't wait to try this with my girlfriend's when we have our potlucks! Lovely refreshing drink. Perfect for summer gatherings. Pineapple mojito is the best one, yours looks awesome. Thanks for sharing. What a refreshing drink! Grilling the pineapple is a great idea! The little hearts are so cute! I imagine this would be a brilliant digestive aid! I love mojito. Adding the pieces of grilled pineapple pieces makes it more droolworthy..